Pics galore beneath the fold. The desk in my home-office (click on the above for the full-size view). The LCD monitor/keyboard/mouse combo on the left is for my main gaming computer. 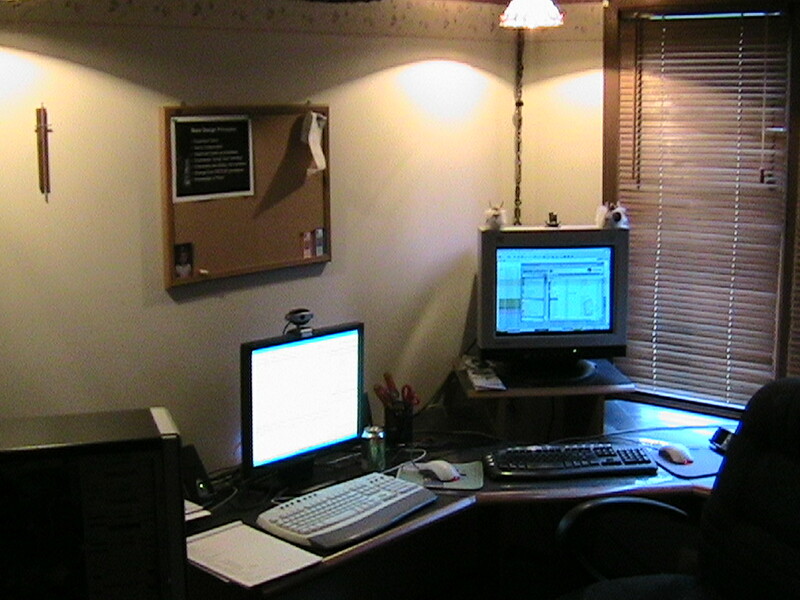 The older CRT/keyboard/mouse combo on the right is for work. 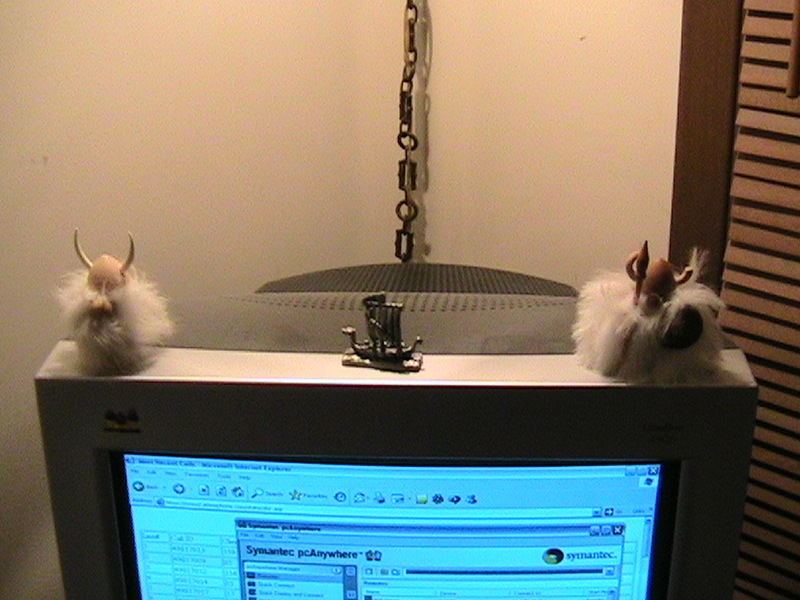 Both have attached KVM switches as well, since I have an older gaming box that I can use for some games with somewhat lower specs (Shadowbane, once upon a time; only CoH/CoV, of late) and do some dual-box gaming when the mood takes me. The previously mentioned flaky PC is up top at the moment, having had some attention this weekend. The e-machines mutant in the center is my reserved-for-work box (not good for much else). The white box to the right is the older gaming machine, one that would now need a complete overhaul to do much more than WoW or CoH on lowest settings. 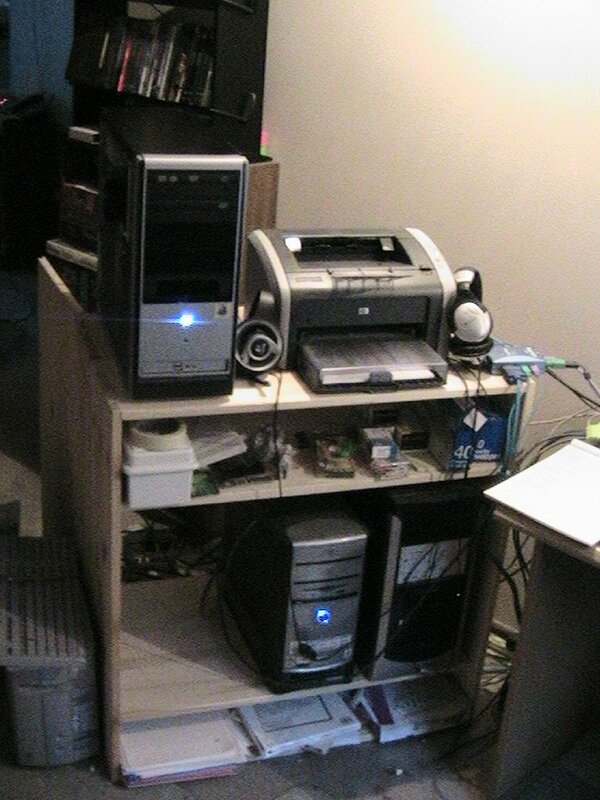 Printers, headphones, KVM switches… and cords everywhere. The corner hutch is a great example of my usual default filing technique… i.e., “piling”. 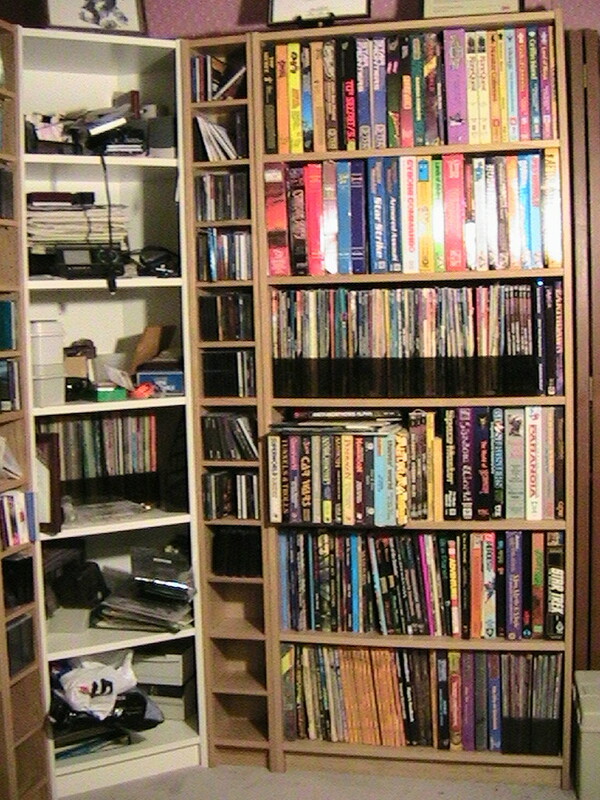 The full length CD racks are mostly games or other software, of course… a little music in there, but not much, I usually prefer silence. 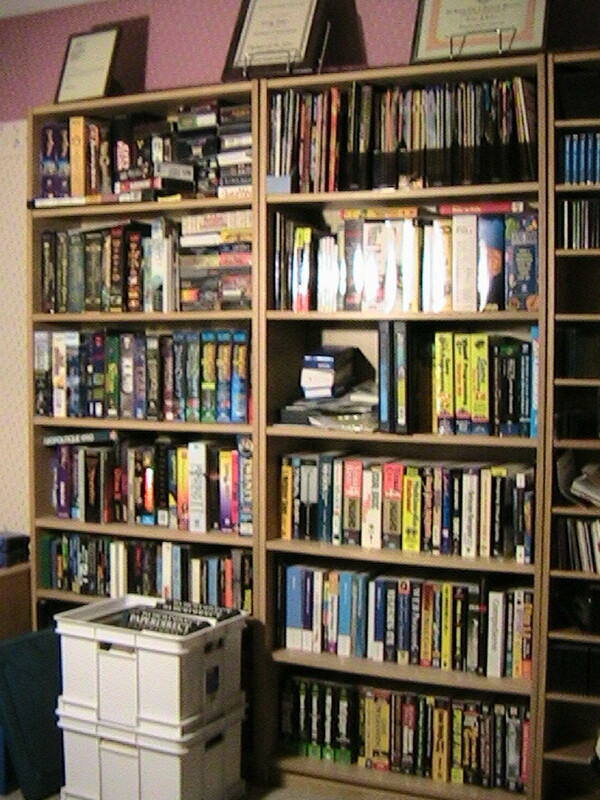 The bookshelf on the right is the main body of my RPG rulebook collection, some modules and expansion books as well. 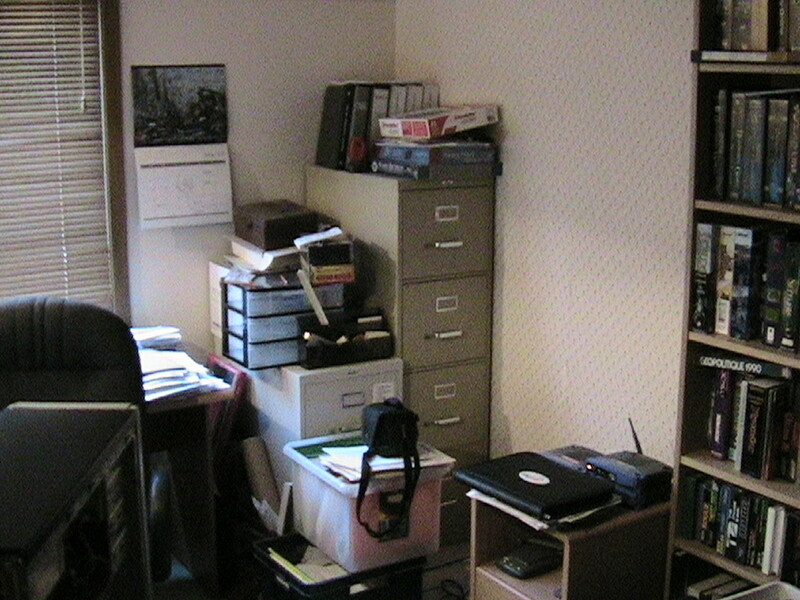 There’s an unpictured closet to the right with more software from ancient times, stuff like Clipper, Access 1.0, Turbo C for the Mac, that kind of thing… and that’s about it. So, that’s Damiano’s inner sanctum. It’s not quite the Batcave, but it suits me, I guess. Almost forgot *smacks you across the back of the head for buying an EMACHINE! * WTF! @Alex: thanks for the kind words… I had plenty of time to clean the area up over the weekend, tho, so I must admit, it’s usually not quite that organized. At a minimum, there are usually printouts and mail piled rather haphazardly around.